The last thing Gemma Pope expects to study in the after-school book club is demon etiquette but that is exactly what she has to do to succeed as a summoner and save her hometown. Since taking the blame for the car accident that claimed the lives of her twin brother and two of her best friends, she s been seeing things. Dark shadows, opaque, menacing, multiplying. The clock starts ticking when the local mild-mannered librarian suffers a psychotic break and pulls a gun on her reading circle. People are dying in disasters and wars all over the world. Gemma s dad is getting weird, her classmates are becoming violent, and the darkness surrounding Harrisport is getting thicker. Does she trust hot English Lit teacher Mr. Flynn or Ian, the mysterious new kid in town, who has knowledge beyond his years and access to other dimensions? It is only when the gates to hell are opened, that Gemma learns who her real friends are. Discover what lies just beyond the veil of humanity in the sleepy town of Harrisport. 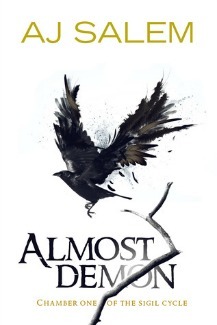 Almost Demon had a lot of potential with an intriguing plot. I was really excited to read it. Unfortunately, it didn’t completely live up to my expectations. The MC, Gemma, was very passive in the book. She didn’t question anyone or anything and she trusted everything everyone said. Maybe if there had been more background concerning Gemma after the accident – what happened, when she started seeing ghosts, how she handled it, etc – then I would believe her not questioning all the supernatural stuff that happened. Clearly she’s used to seeing weird things because she can see the Dybbuk. But we had very little else to go on and it just made it hard to comprehend how Gemma could be so accepting and trusting, without really questioning anything or worrying if she was doing the wrong thing. Especially with Mr. Flynne and Ian.. She barely knew them and she acted as though they were the most honest and trust-worthy people in her life, like they would never steer her wrong. I didn’t trust Mr. Flynne at all. I didn’t really fall for Ian or trust him completely, either. Gemma kind of has a crush on both guys, but I didn’t really picture her with either of them. The Dybbuk and the possessions were really frustrating, especially where Allison was concerned. I know she was possessed and therefore not herself, but the things she said and did really irritated me. It was too much. I know the Dybbuk are evil and all that, but it was just too much drama and bitchiness for me. I felt the same way with the scenes with the Dybbuk and her father. I actually almost DNF’d because of the Allison scenes, but I pushed through because the plot had me intrigued and I really wanted to find out what happened next and see how it ended. About halfway through, I had a hunch who “Ghosty” was. In the end, my hunch was proved to be right! So that was kind of cool. Some of the scenes happened way too fast. There was no build-up, no time to process everything and then before you know it, the scene is over, the event has passed and there is very little explanation afterwards of what happened. I was actually really confused at times. I had to re-read a lot of sections. Near the end, there were two pretty significant revelations concerning two characters. But… They really didn’t come as a surprise for me. I had already figured both out – most of it, anyway. It was a little bit anti-climatic, honestly. There were so many places in the book where it was obvious something wasn’t right with those characters. And because it was so predictable, it took the fun out of finding out the truth. In general, the writing and plot had so much potential, but it was too flat and too fast and I didn’t pick up on the feeling of danger or impending doom. I felt very detached from the story and the characters. It DID get brownie points for being set in the Hudson Valley (Hometown advantage, FTW!). Overall, I had some issues with Almost Demon but it wasn’t a bad read at all. I know I’ve said it a lot, but it had so much potential and I did enjoy the overall concept of the story. It had a fairly unique plot and that definitely made it more interesting and noteworthy. I’m definitely interested in seeing what Salem comes up with next! It was still a good book, but it had potential to be great. Let me know what you think if you read it!